Handsome square walnut frame Mid-Century Modern end table or side table with gorgeous black marble insert top. This table is in fabulous vintage condition. circa 1960s-1970s. Sophisticated and timeless; and, just like that little black dress, can go anywhere. This midcentury walnut side table, accent table or end table is just that. Comprised of a beautiful walnut frame with slightly tapered square legs and a perfect top overhang with a slightly raised marble insert of the most wonderful black gold veined marble I’ve seen for some time. With its simple clean lines, it will hold its own beside any iconic chair in your collection. It is easy to move, and the marble provides a nice safe spot to set a cocktail or cup of coffee. 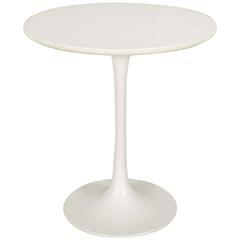 Make this perfect little table yours and be amazed at how many places you can use it. Table: • Height – 16.5 inches • Width – 18.75 inches • Depth – 18.75 inches • Marble Insert Size – 17 x 17 x 1 inches • Weight – 31.3 pounds Boxed Size: • Height – 26 inches • Width – 26 inches • Depth – 26 inches • Weight – 50 pounds. This table and marble are in fabulous vintage condition. Lovely lucite and walnut side end table. This piece is in nice vintage condition with only minor wear. The glass will be a new piece and can be a custom size. An awesome studio made soapstone side table. It features thick cuts of soapstone with beautiful natural dark tones. A truly one of a kind piece. Extremely heavy. Maitland Smith Asian influenced Ming style side end occasional or drinks table rendered in tessellated black marble. American of Martinsville Mid-Century Modern side table or end table with drawer. The piece has some wear and nicks to the surface but is in overall good vintage condition. A beautiful set of Mid-Century Modern side, drinks, or end tables. Both have veneered tops; black and beige/cream. Measurements: 17.75 in. square x 16 in. H.